Think making mosaics with your young child sounds like a cement-y mess? Think again. Our method makes it extremely easy, fun and fabulous for even young children to make amazing mosaics. Generally the studio is a quiet creative space designed for artists 12 and over but…. because we know mosaics and kids are a perfect irresistible combination, we do offer some great ways for you to make mosaics with your kids. Several times a month we sweep up all the shards of glass and open the studio for our younger artists (under 12). 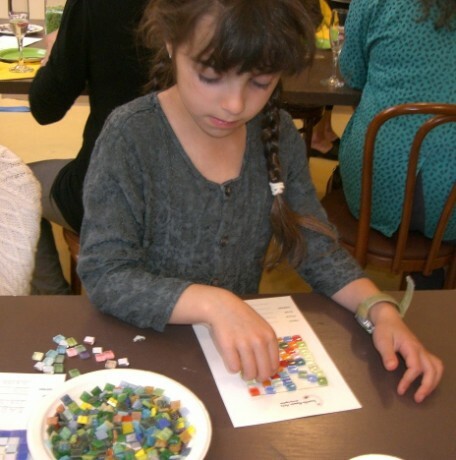 During these Kid’s Clinics, child and adult work together (we recommend one adult per child) to create a mosaic masterpiece. The adult learns how to cut the glass and the child designs the mosaic using our very kid-friendly method. Once the mosaic has been designed, leave it for us to do the cementing and grouting for you! Choose one of our many available mosaic projects and leave it with us to grout and cement, or else the adult can join our studio, learn the full technique and then do the finishing anytime we are open. Price varies per project. Prices start at $55 and are based on project. Pre-registration with $20 deposit required per child (adult does not need to pre-register) to hold your spot. Can’t make it to the studio during Kids’ Clinic hours? Want to work on a larger project on your own time frame? We can easily create a custom take-home mosaic kit just for you. Choose the project you would like to create and we will prepare the template for you all ready to receive mosaic tiles. Pick out glass. If you live near the studio, you are free to come and swap glass as you work. Bring back designed mosaic and choose your grout color. We’ll do all the finishing (cementing and grouting) for your masterpiece and call when it’s all done — usually between one and two weeks later. Mosaics make a great way to host a creative birthday party for kids of all ages. Much like the take-home kit, only on a larger scale, our Mosaic party Kits for children’s parties are custom created and ready for you to take home for an engaging party activity with no mess. Makes a beautiful, lasting, and useful party favor. Custom Kit – Choose from any of our available mosaics and we will help adapt to your age group and size.